Taj Mahal is a white marble structure located in Agra, Uttar Pradesh, India. It is believed to be built by Mughal emperor Shah Jahan in memory of his third wife, Mumtaz Mahal, but there are multiple proofs to prove it wrong ! Taj Mahal is a corrupt form of the sanskrit term Tejo-Mahalay signifying a Siva Temple. Agreshwar Mahadev i.e., The Lord of Agra was consecrated in it. The tradition of removing the shoes before climbing the marble platform originates from pre Shahjahan times when the Taj was a Siva Temple. Had the Taj originated as a tomb, shoes need not have to be removed because shoes are a necessity in a cemetery. The term Tajmahal itself never occurs in any mogul court paper or chronicle even in Aurangzeb’s time. The attempt to explain it away as Taj-i-mahal is ridiculous. The ending “Mahal” is used for hindu palaces and is never muslim because in none of the muslim countries around the world from Afghanistan to Algeria is there a building known as “Mahal“. The unusual explanation of the term Tajmahal derives from Mumtaz Mahal, who is buried in it, is illogical in at least two respects viz., firstly her name was never Mumtaj Mahal but Mumtaz-ul-Zamani and secondly one cannot omit the first three letters “Mum” from a woman’s name to derive the remainder as the name of the building. Since the lady’s name was Mumtaz (ending with ‘Z’) the name of the building derived from her should have been Taz Mahal, if at all, and not Taj (spelled with a ‘J’). If one observes history, Mumtaz-ul-Zamani (3rd wife of Aurangzeb’s father Shahjahan) died in 1631 AD, and it is said that it took 22 years to build the Taj. Then the present Taj must have been completed in 1653 AD. Then how did Aurangzeb order repairs for absorbed water through seepage and leaking walls in 1652 AD ? He definitely ordered to repair an old building through his letter found in recorded in at least three chronicles titled ‘Aadaab-e-alamgiri ‘, ‘Yaadgaarnama ‘and the ‘ Muraaqqa-I-Akbarabadi ‘ . If Taj was a new building, there would no doubt not be any need for such extensive repairs like the roof be opened up and redone with mortar, bricks and stone. Taj was originally built in 1155 AD by Raja Paramardi Dev and a Sanskrit inscription too supports the conclusion that the Taj originated as a Siva temple. Wrongly termed as the Bateshwar inscription (currently preserved on the top floor of the Lucknow museum), it refers to the raising of a “crystal white Siva temple so alluring that Lord Siva once enshrined in it decided never to return to Mount Kailash his usual abode“. That inscription dated 1155 A.D. was removed from the Tajmahal garden at Shahjahan’s orders. Historicians and Archeaologists have blundered in terming the insription the `Bateshwar inscription‘ when the record doesn’t say that it was found by Bateshwar. It ought, in fact, to be called `The Tejomahalaya inscription‘ because it was originally installed in the Taj garden before it was uprooted and cast away at Shahjahan’s command. A wooden piece from the riverside doorway of the Taj subjected to the carbon 14 test by an American Laboratory, has revealed that the door to be 300 years older than Shahjahan,since the doors of the Taj, broken open by Muslim invaders repeatedly from the 11th century onwards, had to b replaced from time to time. The Taj edifice is much more older. It belongs to 1155 A.D, i.e., almost 500 years anterior to Shahjahan. Above picture is a copy of two pages from the Badshahnama, the history of Shah Jahan, the so-called builder of the Taj Mahal. This is from the Government of India’s National Archives, and available from the institutional libraries dealing with the medieval history of India. 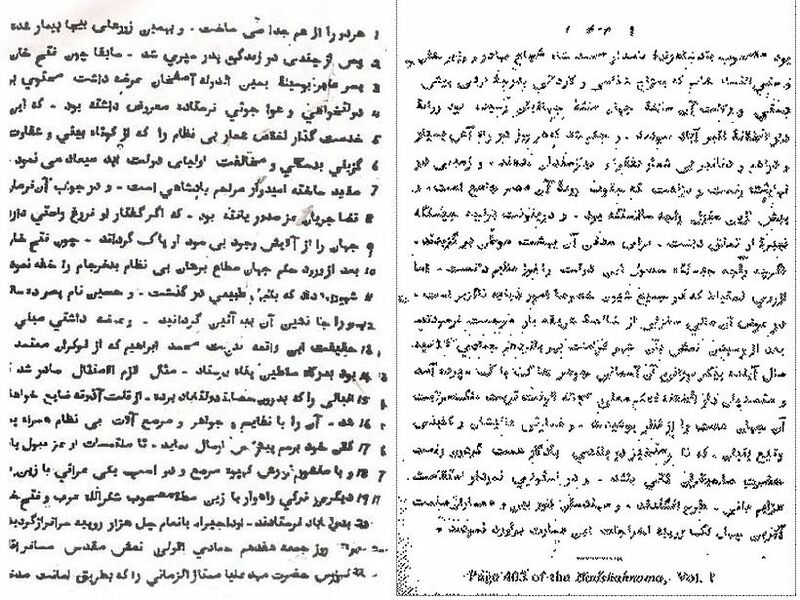 English translation of the contents from line 21 of page 402 to line 41 on page 403 of Badshahnama is given below. “Friday, 15th Jamadiulawal, the sacred dead body of the traveller to the kingdom of holiness Hazrat Mumtazul Zamani, who was temporarily buried, was brought, accompanied by Prince Mohammad Shah, Suja bahadur, Wazir Khan and Satiunnesa Khanam, who knew the pemperament of the deceased intimately and was well versed in view of that Queen of the Queens used to hold, was brought to the capital Akbarabad (Agra) and an order was issued that very day coins be distributed among the beggers and fakirs. The site covered with a majestic garden, to ther south of the great city (of Agra) and amidst which the building known as the palace of Raja Man Singh, at present owned by Raja Jai Singh, grandson of Man Singh, was selected for the burial of the Queen, whose abode is in heaven. Although Raja Jai Singh valued it greatly as his ancestral heritage and property, yet he agreed to part with it gratis for Emperor Shahjahan, still out of sheer scrupulousness and religious sanctity, he (Jai Singh) was granted Sharifabad in exchange of that grand palace (Ali Manzil). After the arrival of the deadbody in that great city (of Agra), next year that illustrious body of the Queen was laid to rest and the officials of the capital, according to royal order, hid the body of that pious lady from the eyes of the world and the palace so majestic (imarat-e-alishan) and capped with a dome (wa gumbaje) was turned into a sky-high lofty mausoleum”. seven storied temple mansion comprises of majestic garden, interior water well, 400 to 500 rooms, 22 apartments, archaded verendahs, terraces, multi stored towers, underground passage, guest rooms, stables, music house, drum chamber, cowsheds, and guard rooms — that necessarily form part of a palace. On the pinnacle of the dome is the Trishul (the trident), red lotus at apex of the entrance, typical Vedic style corridors and the sacred, esoteric letter “AUM” carved on the exterior of the wall of the sanctum sanctorum now occupied by the cenotaphs were of Hindu architecture, built by Hindu craftsmen, with Hindu design. Its marblework is similar to the Amber palace at Jaipur built more than five hundred years earlier by Raja Man Singh I in 1592 AD and completed by Sawai Jai Singh I. They must have adapted the idea of Amber Palace from Tejo-Mahalay, which was built much earlier. ShahJahan states that a grand mansion of unique splendor, capped with a dome, (imaarat-e-alishan wagumbaze) in Agra was taken from the Jaipur Maharaja Jaisingh for Mumtaz’s burial. During the last few centuries the residents of Agra had to be content with worshiping at only four prominent Siva temples viz., Balkeshwar, Prithvinath, Manakameshwar and Rajarajeshwar. They had lost track of the fifth Siva deity which their forefathers worshiped. Apparently the fifth was Agreshwar Mahadev Nagnatheshwar i.e., The Lord Great God of Agra, The Deity of the King of Cobras, consecrated in the Tejo Mahalay (Taj Mahal). The famous Hindu treatise on architecture titled Vishwakarma Vastushastra mentions the ‘Tej-Linga’ amongst the Sivalingas i.e., the stone emblems of Lord Siva, the Hindu deity. Such a Tej Linga was consecrated in the Taj Mahal, hence the term Taj Mahal alias Tejo Mahalay. The other name of the emblem was Agreswar Mahadev and it is important to note that from the word Agreswar, the name of the city of Agra has been derived. A locality in, nearly 4 km away from Taj Mahal, is called Bateswar and in 1900 A.D., General Cuningham, the then Director of the Archaeological Survey of India (ASI), conducted an excavation at Bateswar and discovered an edict, now known as the Munj Bateswar Edict and kept at the Lucknow Museum. The epigraph contains 34 verses written in Sanskrit, out of which 25th, 26th and 34th verses are important in the present context. “The King has built another marble temple which has been dedicated to the Lord Who has the moon as His ornament on His forehead” (26). The Munj Bateswar Edict was laid by King Paramardi Dev of the Chandratreya dynasty on Sukla Panchami in the month of Ashwin, in the year 1212 Vikram Samvat (or A.D. 1156). King Paramardi Dev built two magnificent temples with white marble, one for Lords Vishnu and the other for Lord Siva and they were desecrated later on by the Muslim invaders. Perhaps a farsighted man took the edict to a safer place at Bateswar and buried it beneath the ground for our generation to discover the truth behind Taj Mahal. Today, there are two marble palaces in Agra, one is the Mausoleum of Idmat-ud-Daula, the father of Noorjahan and the other is Taj Mahal, and it is evident from the Munj Bateswar edict that, once upon a time, one of them was the temple of Lord Vishnu and the other was a temple of Lord Siva. It is the temple of Vishnu that has been made the mausoleum of Idmat-ud-Daula, and the temple of Siva has been converted into the mausoleum of the queen Arjumand Banu. The use of captured temples and mansions as a burial place for dead courtiers and royalty was a common practice among Muslim rulers. For example, Hamayun, Akbar, Etmud-ud-Daula and Safdarjung are all buried in such mansions. Many rooms in the Taj Mahal have remained sealed since Shah Jahan’s time, and are still inaccessible to the public. The Rajasthan State archives at Bikaner preserve three other firmans addressed by Shah Jahan to the Jaipur’s ruler Jaising ordering the latter to supply marble (for Mumtaz’s grave and koranic grafts) from his Makranna quarris, and stone cutters. Jaisingh was apparently so enraged at the blatant seizure of the Tajmahal that he refused to oblige Shah Jahan by providing marble for grafting koranic engravings and fake centotaphs for further desecration of the Tajmahal. Jaising looked at Shah Jahan’s demand for marble and stone cutters, as an insult added to injury. Therefore, he refused to send any marble and instead detained the stone cutters in his protective custody. The ex-Maharaja of Jaipur retains in his secret personal ‘KapadDwara’ collection two orders from Shahjahan dated Dec 18, 1633 (bearing modern nos. R.176 and 177) requestioning the Taj building complex. That was so blatant a usurpation that the then ruler of Jaipur was ashamed to make the document public. Bernier, a contemporary French visitor has noted that non-muslim’s were barred entry into the basement (at the time when Shah Jahan requisitioned Mansingh’s palace) which contained a dazzling light. Obviously, he reffered to the silver doors, gold railing, the gem studded lattice and strings of pearl hanging over Siva’s idol. Shah Jahan comandeered the building to grab all the wealth, making Mumtaz’s death a convineant pretext. Dome: A central dome with cupolas at its four corners is a universal feature of Hindu temples. Pillars: The four marble pillars at the plinth corners are of the Hindu style. They are used as lamp towers during night and watch towers during the day. Such towers serve to demarcate the holy precincts. Hindu wedding altars and the altar set up for God Satyanarayan worship have pillars raised at the four corners. The Taj Mahal has towers, but no minarets. Hindu towers always start from the floor level, but moghul minarets rise from the shoulder of buildings. Octagonal shape: The octagonal shape of the Taj Mahal has a special Hindu significance because Hindus alone have special names for the eight directions, and celestial guards assigned to them. The ground plan consists of an octagonal central domed chamber with an inverted lotus crown, surrounded by four small domed chambers. This is the traditional form of Hindu architecture found in the Shilpa shastra (science of architecture). The pinnacle points to the heaven while the foundation signifies to the nether world. Hindu forts, cities, palaces and temples generally have an octagonal layout or some octagonal features so that together with the pinnacle and the foundation they cover all the ten directions in which the king or God holds sway, according to Hindu belief. Trident pinncle: The Tajmahal has a trident pinncle over the dome. A full scale of the trident pinnacle is inlaid in the red stone courtyard to the east of the Taj. The central shaft of the trident depicts a “Kalash” (sacred pot) holding two bent mango leaves and a coconut. This is a sacred Hindu motif. Identical pinnacles have been seen over Hindu and Buddhist temples in the Himalayan region. Tridents are also depicted against a red lotus background at the apex of the stately marble arched entrances on all four sides of the Taj. People fondly but mistakenly believed all these centuries that the Taj pinnacle depicts a Islamic crescent and star was a lighting conductor installed by the British rulers in India. Contrarily, the pinnacle is a marvel of Hindu metallurgy since the pinnacle made of non-rusting alloy, is also perhaps a lightning deflector. That the pinnacle of the replica is drawn in the eastern courtyard is significant because the east is of special importance to the Hindus, as the direction in which the sun rises. The pinnacle on the dome has the word ‘Allah’ on it after capture. The pinnacle figure on the ground does not have the word Allah. Gardens: Description of the gardens around the Taj of Shah Jahan’s time mention Ketaki, Jai, Jui, Champa, Maulashree, Harshringar and Bel. All these are plants whose flowers or leaves are used in the worship of Hindu deities. Bel leaves are exclusively used in Lord Siva’s worship. A graveyard is planted only with shady trees because the idea of using fruit and flower from plants in a cemetary is abhorrent to human conscience. The presence of Bel and other flower plants in the Taj garden is proof of its having been a Siva temple before seizure by Shah Jahan. Yamuna river: Hindu temples are often built on river banks and sea beaches. The Taj is one such built on the bank of the Yamuna river — an ideal location for a Siva temple. When the Taj Mahal was built, it is claimed that the river Yamuna was half a mile away from the structure, but that the river was diverted to flow alongside the Taj Mahal. The truth of the matter is that the moghul regime lacked any civil engineering skill. Hindu palaces, however, always used to be built alongside the river. Behind the Taj Mahal is a well built and paved river bank (known as a Ghat), used by Hindu royalty for the purpose of bathing. The gateways opening to the rear were later closed. Resemblance of a Palace: There is an underground passage leading from the Taj Mahal to the Agra Fort, indicating its origin as a palace. And there are defensive hillocks (to prevent catapults being launched) as well as a moat to the rear. Ganesa Torana: On the main gateway, the entire border at waist-height is decorated with what is called the “Ganesa Torana” (the elephant trunk and the crown can be clearly identified). In the southern entrance to the outer precincts of the Taj Complex (i.e., the Taj Gunj gate facing the main gateway), above the door arch, there is a small arched recess. It is customary in Hindu Forts (for example, the Nagardhan Fort near Nagpur) to place an idol of Lord Ganesa in a similar recess above the main entrance. Could it be that the recess above the Taj entrance also contained a similar idol, which was subsequently removed by the iconoclastic invaders ? Taj is a seven storied building. Prince Aurangzeb also mentions this in his letter to Shahjahan. The marble edifice comprises four stories including the lone, tall circular hall inside the top, and the lone chamber in the basement. In between are two floors each containing 12 to 15 palatial rooms. Below the marble plinth reaching down to the river at the rear are two more stories in red stone. They may be seen from the river bank. The seventh storey must be below the ground (river) level since every ancient Hindu building had a subterranian storey.